Life-Like’s Diesel Freight Set is the typical train set of its time, 1970, as well as years before and after. The set is illustrated in the early 1970s catalogs with a yellow and green Chicago & North Western F7A diesel locomotive heading up a pair of freight cars, gondola and refrigerator car, and caboose. The set came with track and power pack and listed for $25 in 1970 and carried Life-Like’s 3P3 stock number that year. Road names available, according to early 1970s catalogs, included Penn Central and Union Pacific, in addition to Chicago & North Western. Life-Like acquired its HO-scale model train toolings from Varney. 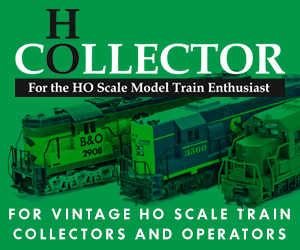 This set includes rolling stock that originated with Varney’s line and the freight cars date to the 1950s for original introduction in the hobby. The F7A started it career in model railroading as Penn Line’s model and moved to Varney in the mid-1960s and on to Life-Like in the 1970s.